Born in DC, grew up in Rochester, NY! Pre-race: Bagel with peanut butter; post-race: pancakes on pancakes! I am usually rotating through books: currently I am reading books by Abraham Verghese (medical fiction), Timothy Snyder (European history), and Nick Offerman (comedy). My favorite authors are PG Wodehouse, George Orwell, Jane Austen, Philip Roth, JK Rowling, Kurt Vonnegut, and Jack Kerouac. Be the best runner I can be. Running wise, I would love to run as many races as possible in as many cities as possible and meet all kinds of runners. I’m signed up for about 40 races this year. Because it is my favorite thing to do. 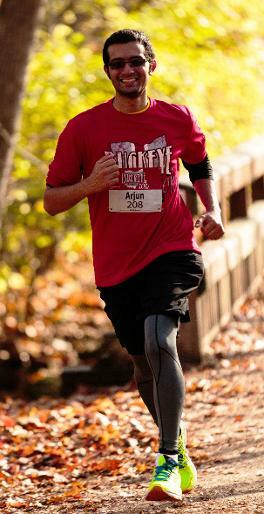 I was a non-competitive runner for a while. I signed up for the Pittsburgh marathon on a dare and because I thought the mental and physical strain would be good practice for the bar exam. I love the excitement, optimism, and tenacity of runners on race day. All of the hours of preparation, the hard training, the sacrifices; they all culminate, you put your best foot forward, and you just run like you were born to do it. I don’t remember much from my only marathon, except that I was effervescent for the first 10 miles and down and out the last 16. 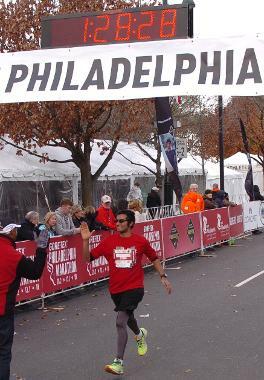 My best running memory is seeing on the clock that I was PR’ing the half marathon in Philadelphia, pointing to the finish line, and mustering a final sprint to high five Mayor Michael Nutter at the finish line. I lived in Philadelphia as a young child, so it was additionally special to run that race. My second best memories are any time my parents are at the finish line. I want to share my love of running with others and help them to achieve their best or at least find happiness with running like I have. My best race results have come by being pushed by a pacer or similarly paced runner. Sharing running accomplishments with others is uplifting and magical. 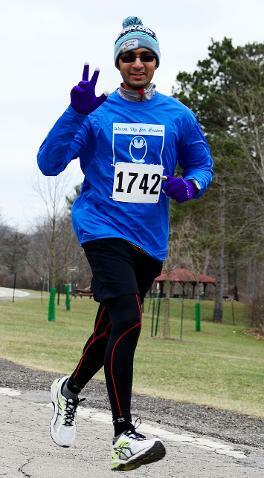 Helping pace a mother who had recently given birth, a middle-aged man who was pushing himself, and a young woman running her heart out to PRs in a 5k/10k. The man stuck with me for most of the last 3 miles, but then he saw his family as he turned the corner to finish, stopped to give them all high fives, and then he sprinted the finish as if he had not pushed himself to the limit the first 6 miles. Because I have made so racing mistakes that I have dedicated my pacing to remedying those mistakes. That includes the notorious starting out way too fast, lining up in the wrong pace group, blowing it on hills, not drinking/eating properly during the race, dressing poorly. My goal is to make sure that you achieve the result you want while running a strong race and smiling across the finish line, wishing there was still another mile to go, rather than being relieved it is done. Please start slow. Absorb the excitement and adrenaline of race day, but be heady; they don’t give awards for winning the first mile. Enjoy the social atmosphere and sights of a race. The result does not tell the story of a race. You can run a terrible race or a great race and achieve the same result. You would rather run the great race because then you can look back fondly at all of the miles, rather than just heralding the result only. Make all of your miles count, not just the final time. I want you to run a great race that you will remember fondly because you were intelligent and strong throughout it. I’ll shout tips and encouragement throughout the race and help you finish with a smile, hopefully as you finish ahead of me. I’m mostly a half marathoner and shorter distances runner. I love talking running, breakfast food, Seinfeld, and the Simpsons. If you know of any races I need to run, please tell me!